I'm not Irish, and I only eat corned beef and cabbage when someone else makes it for me (pastrami is another story.............). However, I love the Irish traditions and cakes and stews made with Guinness Stout. Last year it was a Chocolate Guinness Cake, which was delicious. This year it's my mother in law's Irish Soda Bread along with this DELICIOUS Guinness Beef Stew. 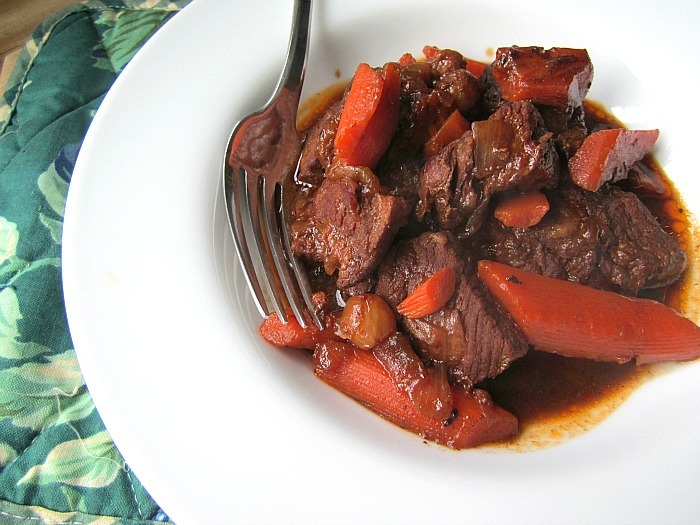 There are a ton of recipes out there, and like any beef stew, there are no rules. You can add potatoes or not, wine, beer, stock, water, any braising liquid you like. I chose this recipe from Cooking Light because it was different. It uses a tablespoon of raisins, and caraway seeds, along with turnips and parsnips. I have made it twice so far, and the second time I made it, I only used carrots and onions. I took one of the commenter's suggestions and added CHOCOLATE & COFFEE to my beef broth thru a French press, yes, I know, daring. (here is her comment: "I make this all the time. Instead of using just beef broth, try heating your broth and running it through a French press with some dark roast coffee and unsweetened cocoa. Adds another layer to an already great dish. If you think it sounds strange you could always try a chocolate coffee stout beer, like bison, instead of Guinness"). I enjoy reading the comment section, because you get some good ideas and opinions on whether or not the recipe worked out. It was SO GOOD this way. The chocolate with the Guinness, and the coffee thing was amazing. I also like to make my stew in the oven, instead of the stovetop. The Le Creuset Dutch oven seals in everything and the sauce really reduces beautifully and caramelizes the meat. Here is the Cooking Light Recipe, which I made my own changes and additions to. Feel free to substitute or add what you like, however, please use the raisins and caraway seeds, I promise it makes the difference. Heat 1 1/2 tablespoons oil in a Dutch oven over medium-high heat. Place flour in a shallow dish. Sprinkle beef with 1/2 teaspoon salt; dredge beef in flour. Add half of beef to pan; cook 5 minutes, turning to brown on all sides. Remove beef from pan with a slotted spoon. Repeat procedure with remaining 1 1/2 tablespoons oil and beef. Don't crowd the meat, you want a good sear, not steam. Do this in batches. Stir in broth and beer, scraping pan to loosen browned bits. Return meat to pan. Stir in remaining 1/2 teaspoon salt, raisins, caraway seeds, and pepper; bring to a boil. Cover, and place in the preheated oven. Cook 1 hour. After one hour, uncover and stir. 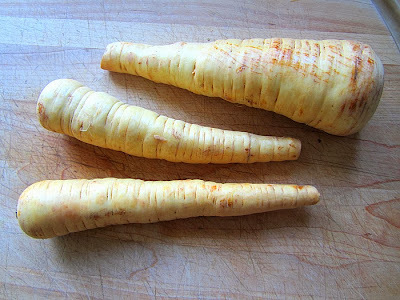 Add carrots, parsnip, and turnips. Cover, and place back in the oven for another hour. The sauce will be nice and thick and the meat and vegetables should be tender. Serve with polenta or mashed potatoes (or on its own). This is one gorgeous stew. Great looking stew, Stacey! 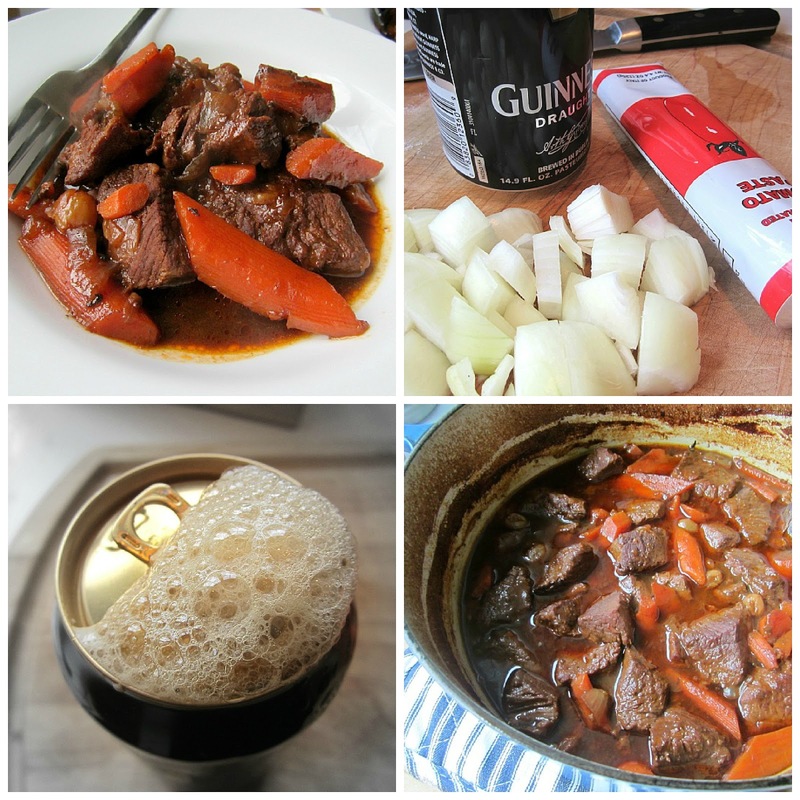 We're not Irish either, but we love stews with beer (!) and make one very much like yours. It's from a Jamie Oliver recipe but once stewed it gets put into bowls and topped with puff pastry and baked. The bottom of the pastry, all rich and buttery, gets soaked in the stew and, well, we're not all about Jamie most of the time, but this one is pub food at its best and is freaking amazing. This looks so good! !Will be making this over the weekend for sure! I always put chocolate in my stews and chilis. It adds a gorgeous element and no one really knows it's chocolate! Great recipe, will try the raisins and caraway seeds, sounds so different. Looks like a very tasty stew Stacey. The addition of cocoa and coffee might have sounded strange to me before, but I encountered a similar thing last year in Siena with a dish there called "dolce e forte" - basically a wild boar stew with chocolate and vinegar. Looks delicious. I'm also trying your mother-in-law's soda bread, since mine was a big flop last week. SEMS: The commenter wrote "unsweetened cocoa", but I used a 1 oz. square of 72% dark sweetened chocolate! You won't make a mistake here.........but maybe, stick to the original Cooking Light recipe with the caraway seeds and raisins.........turnips and parsnips! My husband will get a kick out of me making a beef stew like this, since he is usually the one to make beef stews in our house. I'm glad you posted photos - I don't drink beer & could just see myself asking about the different beer types in the liquor store. 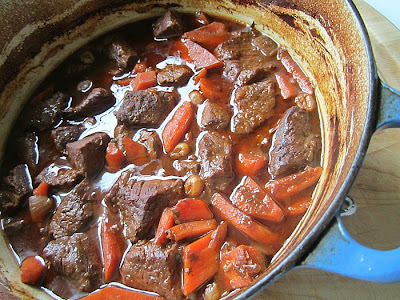 We're not Irish, but I think since everyone is Irish on St. Patrick's Day, I'm going to make this beef stew next Monday. Love the way this sounds!